Nestle has been working very hard to branch out the Wonka line of candy. The new Exceptionals line is an attempt to take Wonka into a premium candy category. I'm not entirely sure this will work with the Wonka brand though. I have reservations because I cannot decide who the target market is for these Fruit Marvels. I'm not sure a parent would spend $2.99 on a 5 oz box of candy and I'm not sure children would even see this candy to ask for it. In our stores these are positioned by the higher end chocolate and are almost eye level. These are not places children are looking for candy. So, the target market must be adults...maybe adults like me who grew up loving Wonka and now have more mature tastes and pocketbooks. However, I'm sure most of you only care about how they taste, so I'll move on to that. Here is the Cliff's Notes version. These are a premium Giant Chewy Nerds/Nerds Bumpy Jelly Beans candy. That seems a little simplistic but it is my overall impression of this candy. Don't get me wrong, that's not a bad thing, I really like Giant Chewy Nerds and this is a much better version of that candy. The big improvement is found in the wonderful crunchy shell. The panned shell is thicker and crunchier than a Giant Chewy Nerd, yet nice and chewy (after you crunch through it) with a super fine dusting of sugar on the outside. I assume the sugar is to keep them from sticking together, but I could be wrong on that. The interior is the same wonderful soft jelly texture as the Giant Chewy Nerds that seems to melt in your mouth, but has a much much better flavor. My guess is that the 25% fruit juice added to this candy is what really makes the difference in taste. Pomegranate - My guess is that most Americans will eat more pomegranate candy this year than actual pomegranates!!! This has a decent pomegranate flavor. I'm not overly impressed with actual pomegranate myself, but this is more flavorful than an actual pomegranate. I'm not a huge fan of this flavor, but it's good. It tastes surprising similar to the new Pomegranate Cosmo Jelly Belly that is out now. White Grape - Very nice white grape flavor, tastes exactly like Welch's white grape juice. Clementine Orange - This was our favorite of the group, but we are citrus fans. This is not an "orange" candy, this is exactly what it says, a tangerine/clementine flavored orange candy. I would definitely buy this flavor again and again and again. These are super sweet and after eating 6 of them my pancreas asked me to stop. I drank a few glasses of water and continued on. I like the route Nestle is taking Wonka and I like this candy. The packaging is amazing and it gives this candy a very premium feel. The outside of the box is beautiful, the fonts and colors are great. I like how it has holes in it so you can see the crazy inside box. Even the UPC code gets Wonka-fied. There is a LOT of packaging for this candy, but I assume that it gives them a premium feel, similar to wedding invitations you put into 2 different envelopes each with its own design. 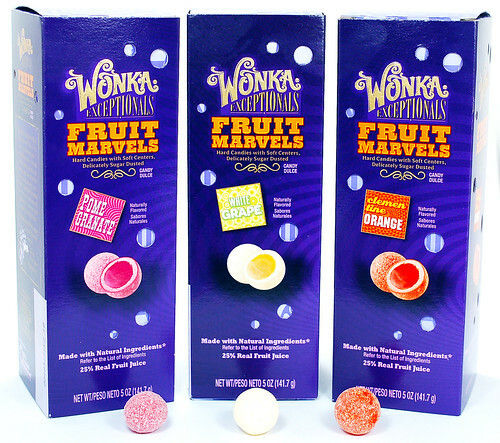 Tomorrow I'll review the Wonka Exceptionals Fruit Jellies. I like them even more than the Fruit Marvels!! You can find other reviews of this candy here, here and here. Yeah, I reckon these are squarely aimed at the adult market. Perhaps at the 20-somethings? I've seen these fellas around but haven't tried any yet: I was worried they'd have a horrible, mushy consistency. So I'm glad you mention that they actually have a nice texture. Next time I see them, I'll pick some up. At Wal Mart in Wisconsin they had them at the register in a fabulous round tin with about 12-15 candies inside. I think the price was around 2.50, a little steep at the register but I couldn't resist, just for the tin. I couldn't decide if I liked them or not, but if I ate one I had to eat a few more. Something about the sour/sweet, powder/jelly that gets you into a rhythm. But I hear what you're saying about the ol' pancreas. Definitely a problem. Thank you for your comments. I hope the price will go down too but I'm not sure if Nestle/Wonka will do that since they want these candies to be "premium". Thanks for reading my review!